Some 1,220 people were arrested in France on Saturday as more than a hundred thousand took to the streets—leading to a lockdown and armored vehicles pouring into Paris—as part of the “Yellow Vests” or “Gilets Jaunes” movement that initially came as a response to French President Emmanuel Macron’s attempt to raise taxes on gasoline and diesel, which critics warn would primarily impact the working- and middle-class. Protesters have largely come from peripheral towns, cities, and rural areas across France and include many women and single mothers. Most of the protesters have jobs, including as secretaries, IT workers, factory workers, delivery workers, and care workers. All say their low incomes mean they cannot make ends meet at the end of the month. The movement is predominantly against a tax system perceived as unfair and unjust, but there are numerous grievances and differences of opinion. Most want to scrap the fuel taxes, hold a review of the tax system, raise the minimum wage, and roll back Macron’s tax cuts for the wealthy and his pro-business economic program. But some also want parliament dissolved and Macron to resign. Among the French, public support for the protests is around 66 percent, according to polling released Friday. High-profile figures such as author and climate activist Naomi Klein have also weighed in. On Twitter Saturday, Klein called out Macron for neoliberal policy that sought to pass on the costs of the climate crisis to the people rather than the polluting industries that have primarily fueled it. The Intercept‘s Glenn Greenwald blasted Neera Tanden of the Center for American Progress and others for framing the protests as merely critiques of Macron’s policy to address the climate crisis—which ignores the actual impacts of the fuel tax and the movement’s broader motivations. That the head of the Democrats’ most influential DC think tank is so rich and insulated that she literally can’t understand the inability of already-struggling rural and working-class voters to pay new taxes, and demonizes their anger of wealth inequality, says it all. From all corners of the country, French protesters— the vast majority of them men—came by the thousands in trains, buses and cars. But once together in the capital, the most concrete thing they shared was simply fury. Fury at President Emmanuel Macron. At taxes. At jobs that don’t pay the bills. At politicians they accuse of stuffing their own pockets. At the elite. At banks. At ‘the system.’ At life in general. “Ras-le-bol”—which translates as “fed up”—was their common complaint. The Champs-Elysées, “Paris’s most famous boulevard simply reeked of tear gas. Clouds of the stuff hung in the air, burning throats but not silencing the sullen, rebellious crowds,” the AP noted. With “noses dripping snot, eyes red and watering,” demonstrators broke out into song—bellowing “The Marseillaise,” France’s national anthem. “The reasons for the protests are not entirely clear. 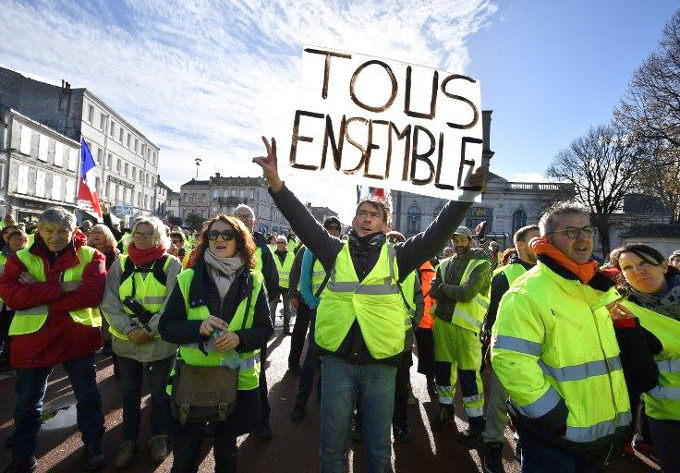 Neither Belgium nor the Netherlands has proposed a hike in fuel tax — the catalyst for the massive and destructive demonstrations in France in recent weeks. This entry was posted in Civil Rights, Corruption, Demonstrations & Protests, Economics, Education, Government, Income Inequality, Social Justice, Women's Issues, Workers' Issues and tagged Capitalism, Civil Rights, Corruption, Economics, Education, Emmanuel Macron', France, Income Inequality, Neoliberalism, Paris, Protests, Solidarity, taxes, Women's Issues, workers' issues, Yellow Vests on December 10, 2018 by MNgranny.